I have written a report on the phenomenon that is content marketing and made it available under a Creative Commons licence. 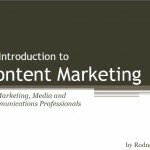 The report (in PDF) is available for free download from my blog here: An Introduction to Content Marketing. Can all benefit from content marketing and should not be have any less of an opportunity to publish their stories than an organisation with a billion dollar marketing budget. One of the benefits of good content is it democratises the reach of the brand: content produced by a start-up can be just as interesting as content produced by a multinational. People are tired of hearing the same old marketing messages and brand messaging needs to become more creative and informative to remain relevant. Independent content production by non-media organisations has been around for a long time – it just wasn’t known as “content marketing”. I will attempt to keep it updated at least quarterly. In fact, just looking at with fresh eyes, it could do with a design makeover so maybe that’s where I’ll next direct my attention.